Dolores is a teacher, a mother, and a friend. She wants to know why her students are too hungry to listen, why they don't have shoes to wear to school. Dolores is a warrior, an organizer, and a peacemaker. When she finds out that the farm workers in her community are poorly paid and working under dangerous conditions, she stands up for their rights. 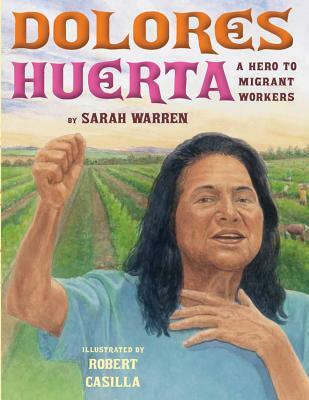 This is the story of Dolores Huerta and the extraordinary battle she waged to ensure fair and safe work places for migrant workers. The powerful text, paired with Robert Casilla's vibrant watercolor-and-pastel illustrations, brings Dolores's amazing journey to life. A timeline, additional reading, articles, websites, and resources for teachers are included.